Customer demands to be in the driver’s seat, seeking helpful input and insights instead of talking to a sales person or going to a store. A constantly growing number of channels and formats required to meet customers where they are and when they want information. Marketers inherently understand that the content arsenal they create is an asset in this content arms race. But most are unable to reuse content without significant effort and admit that they don’t have the processes or tools for scale. Recent research from the Content Marketing Institute suggests that 66% of marketers say their top need to get the most out of their content is training on how to use technology to manage content as an asset. That said, Gartner research shows that many enterprise brands ($500M+ revenue) don’t even have the tools to do so. 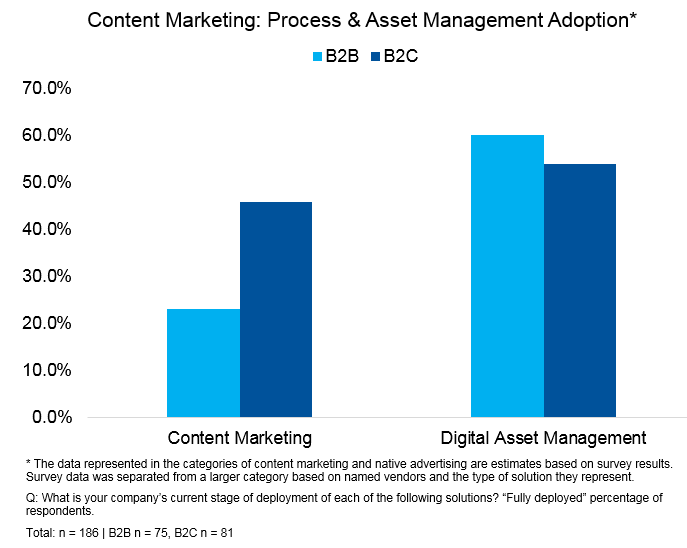 60% of enterprise B2B marketers are using a DAM but only 23% are actively using a content marketing platform to support their editorial processes. B2C brands have invested more in CMPs at 46% using one but just 54% use a DAM. Net, just over half even have a tool to managed their valuable content assets and a very small number have codified processes that happen in something more formal than an excel spreadsheet and email. [For more data on enterprise martech adoption, check out our Marketing Technology Survey 2016: How Marketers Use Technology to Run, Grow and Transform Their Organizations – subscription required. When I talk with marketers about their struggles with content – a common refrain is that they know they are wasting resources because they can’t find or can’t easily reuse the content they’ve created. Brands spend large sums on custom photo shoots, writers, editors and videographers only to lock that content up in big monoliths that get used in a single campaign and never see the light of day again. If we have any hope of graduating from a world where everyone gets a generic message at the time brands define to one where we approximate the right message to the right person at the right time with the right context – we have to do better. Atomic content and personalization is only possible if we, marketers, shift our mindsets, build some new skills and use the tools available to us to attend to the care and feeding of our content library. A few months ago I wrote a very nerdy post about metadata and attributes. It sparked a lot of conversations about how hard it is to do this today. But trust me, it’s getting easier. More tools – some CMPs and some re-imagined DAMs – are making it simpler to store and retrieve assets. The infusion of artificial intelligence (AI) into some of these systems will augment work done by marketers and creatives – taking the drudgery out of tagging and unlocking the value in our content – even making recommendations about which assets may work best for a given situation. What do you have to do to start down this path? Start by recognizing how much value you’ve got locked up. Then think about your highest value assets and how you might split them into atomic parts that can be re-used more easily. Define processes and adopt storage and discovery tools that will make them accessible across the teams that use content. Instill discipline around tagging and measure how much content gets reused versus created anew. Rinse, repeat and build that muscle. Personalization is the awesome thing when its used correctly. i know many people are doing that but failed to get any positive impact. i think the role of CRM is very crucial in content and push marketing. BTW nice blog with analysis. This is right up our alley at MindTouch! Great read Kirsten. Great article! We’re seeing many companies develop a ton of value from this “atomic content” approach in terms of customer engagement (time on site, conversions, deflection) and SEO (highly targeted organic search). It is true that customer needs to be at the drivers seat and is seeking more information rather than talking to sales person. But what is also important is that the salesperson should also think and act on behalf of the customer so that right product can be sold at the right time to the right customer.